Today is a pretty big day for me. I get to officially announce that I am adding something else to my ever growing social media and writing resume. I am now a Media Manager for Rescuehood. Rescuehood is an app that is currently available on the iPhone App Store for just $1.99 (and will soon be available for the Android). If your child goes missing, Rescuehood rallies support for you in seconds, by enlisting the help of other people who are close by. With Rescuehood, you can instantly broadcast an alert with your child’s pre-built profile from your mobile phone, to other mobile phones within your geographic area. As a mom of three small boys, this is so important to me. If you have been reading my blog for awhile, you remember when I lost the Bunny Bee at hockey in an incredibly crowded ice rink. It was beyond terrifying. While he was found in a matter of minutes, having had that experience I know just how important it is to get the word out about your missing child as fast as possible. The thought of having something as simple as an application on your phone... one that you can prefill ahead of time with all of your children's information. Hopefully you never ever need to use it. But if you do? It is all there for you. All you would need to do is add a description of your child’s clothing, specifics about where your child was last seen – and send the alert. That alert goes right to mobile phones within a 5 mile radius of the parent’s current GPS location. 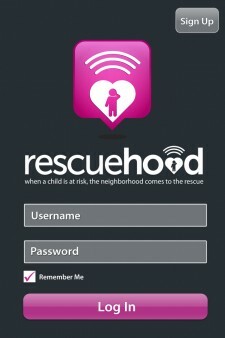 This enables other Rescuehood members to jump into action and provide support to find the child. Rescuehood is not meant to replace contacting the authorities, it is simply another tool to help you locate your child in an emergency. There is even a way to monitor feedback after you have sent out an alert. Responders can even post information to a central message board so you can supervise the communications and locate your child. Being an Android user, the app is not available for my phone yet...but I can not wait till it is! I'm asking all my iPhone mama friends to get this app and help me spread the word. The more people with the app? The quicker we hope to be able to locate a lost child. Isn't it amazing what technology can do?! and get the app for your iPhone here.